In part 3 we discussed how the MCT-1-RF wireless wall mounted timer can be linked to our radio equipped blind and shade motors using RF (Radio Frequency). In part 4, we will learn how to create actual timer events. The picture at left is a detailed view of all the characters and symbols that will be shown in the LCD liquid crystal display, at various different times during the programming process. If you try this now, you should see the time display change according to the table sequence below. Continuously pressing the MENU button should continuously cycle you through the modes displayed below. The OK button is used to actually enter/exit a specific setting mode; the menu button is used to cycle through the various settings while in that specific mode. Please Note: When pressing the buttons, please push them directly and firmly down with your finger. If you push them from an angle, the membrane switch may not make proper contact inside (even though you will still feel the tactile click). Normal Time Display: Display reverts back to clock display when setup of any items below is finished. Set Clock Time & Date: Press MENU until clock display changes to picture at left, then press OK to begin procedure for entering date and time settings (see example 1 below). Display reverts back to clock display when setup is finished. 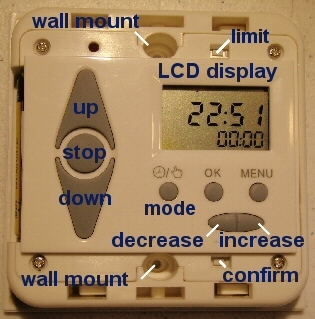 Set Event Timing: Press MENU until clock display changes to picture at left, then press OK to begin procedure for creating a timer event (see example 2 below). Display reverts back to clock display when setup is finished. Check Event Timing: Press MENU until clock display changes to picture at left, then press OK to begin procedure to review event settings (see example 3 below). Display reverts back to clock display when setup is finished. Clear All Events: Press MENU until clock display changes to picture at left, then press OK to begin procedure to clear all timer settings (see example 4 below). Display reverts back to clock display when setup is finished. 10 press OK to complete the procedure and EXIT to regular clock display You could use the MENU button to cycle through the clock settings again, but regular clock display will appear if you press OK button to EXIT the procedure. 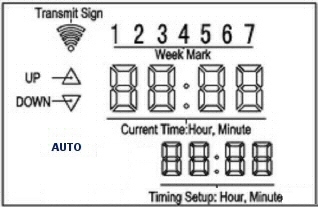 7 press OK to complete the procedure and EXIT to regular clock display Repeat the above procedure to set up to 18 events. 3 press OK to complete the procedure and EXIT to regular clock display Clock display returns to normal.